The number of working age people in China is set to fall to 700 million by 2050 – a decline of nearly a quarter, according to a government spokesman . The working-age population has been in decline since 2012, with the number of people aged 16-59 predicted to be 830 million in 2030. The demographic is expected to decline sharply after this, by 7.6 million on average each year from 2030 to 2050, said Li Zhong, from the Ministry of Human Resources and Social Security. An ageing population poses significant challenges for China in the coming decades. As a result, the government is considering raising the retirement age, said Li. As this chart shows, China’s working-age population is set to undergo serious decline. After reaching 925 million in 2011, China’s working-age population is forecast to fall by 225 million come 2050. This still represents a vast workforce, nearly double the United Nation’s forecast for the total population of the United States in 2050. But, with close to 500 million people expected to be 60 or over in 2050, compared with slightly over 200 million today, China will have to act soon. The age-dependency ratio measures the ratio of dependents – those younger than 15 or older than 64 – to the working-age population. 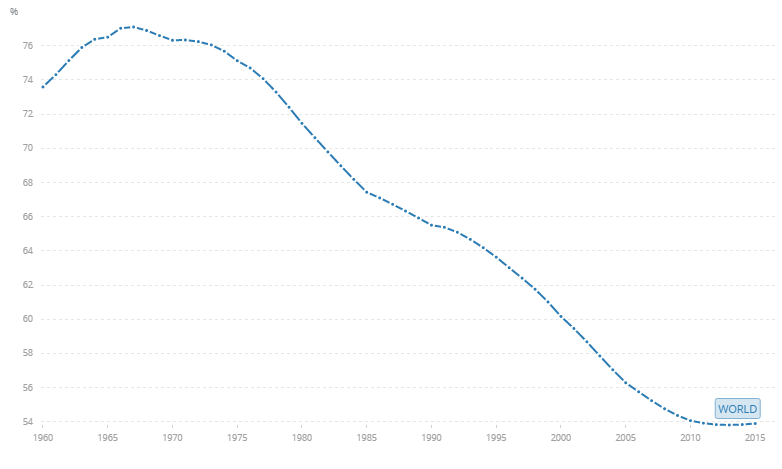 Globally, the percentage of the population that is of working age has been in decline since the mid-1960s, as this chart from the World Bank shows. In China, it has already dropped from over 80% in 1966 to 37% today. As this ratio narrows, it places increasing pressure on those of working age to provide for those not in work – whether directly or through taxes. As a result, governments around the world, including China’s, are considering raising retirement ages. With people living longer, and remaining healthy for longer, a higher retirement age could be a useful tool in tackling the burden of an ageing society. How can China care for its ageing population? These are the world's oldest and youngest countries Should we rethink the concept of working age?